The hustle and bustle of the holiday season is here. And though the holiday is a cheerful and celebratory one, we know that sometimes stress can arise while preparing and planning. Don't fret...we've made a list for you! From decorating and shopping to cooking and merry-making, we've put together twelve quick tips to help you plan for a joyful, relaxing holiday. Keep this list in mind in the coming weeks, and when the holidays hit, you'll be able to really enjoy them. 1. Make lists. 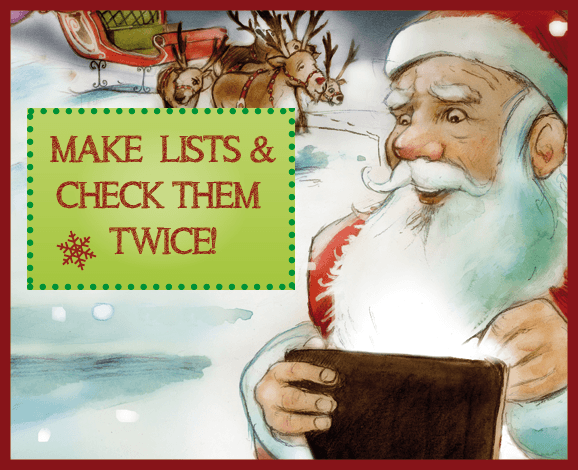 Santa loves lists just as much as we do, so let's use them! Write out all that you need to do to make your holidays special. Organize your list in groups (shopping, decorating, cooking, travel planning, family coordinating, etc.) and then by tasks, in order of importance. Cross out what you've gotten done, and embrace the accomplishment. 2. Don't over-do it! Making a list will help you decipher where you'll want to focus most of your efforts, but this is always a good tip to take seriously during the holidays. 3. Decorate in a stress-free way. Decide what matters most to you and your family in making your holidays festive and start there. If a few decorations don't make it up this year, don't sweat it. If you're looking for a craftier alternative, try making gingerbread houses with your kids or cutting and designing snowflake art to put up around the house (use glitter and paper!). Also—be sure to safety proof your decorations for any little ones roaming around your house, particularly ornaments and Christmas lights. 4. Put 'em to work in your holiday workshop. Have your kids wrap gifts, contribute in the kitchen, and help you assemble and deliver holiday baskets or Christmas cookies. 5. Set a deadline for Christmas lists. Require your children to stick with what they've asked for. You can also try putting together some guidelines for what your children can request from you or Santa. For example, make sure they include one or two books, a craft item, etc. 6. Remind your children what the holiday really means. Explain to them why your family celebrates the way you do and how it's special. Build the message behind the holiday up, rather than emphasizing gift giving. 7. Give your children time (instead of going overboard with presents). Make the focus of the season more about the time you spend together, not the gifts received on the holiday. 8. Simplify holiday cooking. Do your grocery shopping in advance and start prepping meals early. Or, make simple meals that don't require as much time or preparation at all. Don't forget to ask for help in the kitchen! 9. Start your own traditions. Who cares what's considered normal! The holidays are for you and your family to enjoy together in your own way. Do what's accessible for your family and don't worry about what others are doing to celebrate. 10. Take time out for yourself. Find some space away from the holiday chaos. Sing carols with your kids, use the quiet when you can, read stories to your children, or play games as a family. 11. Relax and lighten up. This is the usual case of "easier said than done," but the more you make it your mantra, the easier it will be to do. And, you'll be able to truly relax and enjoy the holidays. 12. Keep calm, and jingle on. If the above mantra doesn't work for you, try this one…it's catchier. P.S. - If You haven't heard yet...Santa is Coming to YOUR House this Christmas! Are your children eagerly awaiting Santa's arrival this year? If they are, you know exactly how much it would mean to them if Santa came right to their very house! 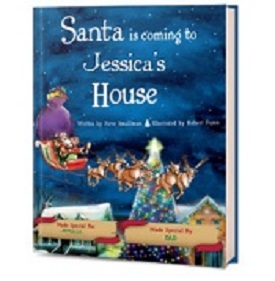 Put Me In The Story's personalized edition of Santa is Coming to My House will light up any child's holiday when they see that their name and picture are part of the story. Your child will see their name printed on the cover and threaded throughout the narrative. They'll star alongside Santa as he navigates his way from the North Pole and all over the globe to land at YOUR house.